Google has announced it is to open up the Twitter archive with a new Replay search function. This means that users will be able to search Twitter's archive for their favourite tweets and see how things like news stories panned out in real time, er, not in real time. 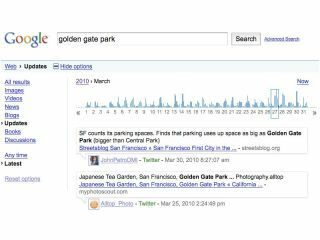 "With the advent of blogs and micro-blogs, there's a constant online conversation about breaking news, people and places – some famous and some local," says Google on its non micro blog. "Tweets and other short-form updates create a history of commentary that can provide valuable insights into what's happened and how people have reacted. We want to give you a way to search across this information and make it useful." How the new service works is pretty simple. When you Google a particular topic, click Show Options, then Updates in the left-hand column and a timeline will appear. Then all you do is click which part of the timeline you want to look at. The timeline shows when Twitter traffic for the topic is at its highest (and probably most interesting). "All of us are just beginning to understand the many ways real-time information and short-form web content will be useful in the future, and we think being able to make use of historical information is an important part of that," notes Google. The feature is currently being rolled out and should be available in "the next few days".